Our Star Table and 2 Chair Set is the ideal place for homework, games or arts and crafts. Because of the table's natural wood, this fun furniture set would look great in any kid's room. 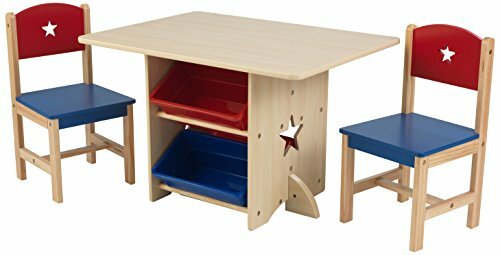 Features: Sized perfectly for kids Two convenient storage bins Bins can be reached from either side of table Star-shaped holes on table and chairs Made of wood Sturdy construction . Specifications: Table: 30"Dx22"Wx20.25"H Chair: 11"Dx10.625"Wx21"H Seat height: 11.75"H Age: 3-8yrs . Table dimensions: 30L x 22W x 20.25H in.